Two built-in DVB-S2 tuners allow an independent twin use. one additional tuner slots offers the possibility to expand your device with DVB-C/T/T2 or DVB-S2X tuners. The strong processor offers the viewer a Ultra high resolution pictures and a never experienced rapid change-over time. Embedded Ethernet controller and optional WiFi USB dongle can connect your TV directly to the Internet and any IPTV service provider. 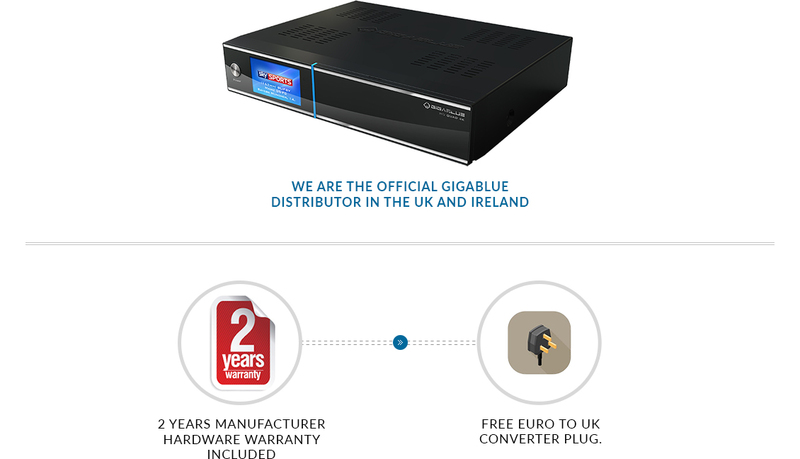 This flagship product is built in GigaBlue production facilities and includes a 2 year warranty. Featuring the powerful BCM7352s video processor is capable of playing back anything from video files stored on external USB/e-SATA drive to network based files or IPTV streams. Three high speed USB 3.0 ports and 2 x HDMI will be more than enough for external storage and expansion modules or devices. Particularly user-friendly shows the GigaBlue in its operating options. Thus, the receiver can, for example, via GigaBlue Player app completely comfortable with the smartphone or tablet remotely without taking only the device's remote control in hand.